Do you want to make your Chevelle, Malibu, or Laguna S3, look as good under the hood as the exterior? Fbodywarehouse has your A body and G body needs covered! We offer a wide selection of new replacement air cleaner and carburetor related items for your car in one place! Superior quality reproduction of original special high performance air cleaner. Includes gloss black body with attached breather tube (1" hose), high pleat count performance air filter and our accurate reproduction OE quality triple chrome plated lid. (spacer needed for aftermarket carbs with electric choke) Officially Licensed GM Restoration Parts. For use on 1966 - 1969 Chevelle with 396 engines reproduction of original special high performance air cleaner four barrel base. Gloss black body with attached breather tube (1" hose). Officially Licensed GM Restoration Parts. For use on 1964 - 1971 Chevelle models.Superior reproduction of original air cleaner breather tube spark arrestor. Double stainless mesh, quality assembly. Fits all one inch breather tubes. Officially Licensed GM Restoration Parts. This is a new replacement choke cover shield for 1966 - 1970 Chevelle models with factory 4 barrel carbs. This is a new replacement choke cover shield for 1970 El Camino models with factory 4 barrel carbs. For 1970 Chevelle with factory 396 engine. This is a complete air cleaner assembly. Faithful reproduction cowl air cleaner assembly in gloss black as original. Includes 4 barrel carb based body with attached breather tube, high pleat count performance air filter, original gauge gloss black lid, 396 extension ring and cowl seal flange. Ships assembled, protectively shrink wrapped and packaged in a heavy double wall logo box. Ready to install. For 1970 1971 1972 Chevelle Models Faithfull reproduction cowl air cleaner assembly in gloss black as original. Includes 4 barrel carb based body with attached breather tube, high pleat count performance air filter, original gauge gloss black lid. For 1970 - 1971 - 1972 Chevelle Models Faithfull reproduction cowl air cleaner assembly in gloss black as original. Includes 4 barrel carb based body with attached breather tube, high pleat count performance air filter, original gauge chrome lid lid. For use on 1970 1971 1972 Chevelle models with cowl induction system. For use on 1970 - 1971 - 1972 Chevelle with cowl induction system. 1970 - 1972 Chevelle with cowl induction.Set of three injection molded ABS clips hold valve to frame. 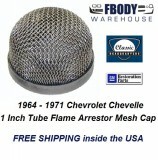 For use on 1970 1971 1972 Chevelle models with cowl induction.OE quality cowl induction firewall relay. Brass contacts and phenolic style injection molded base, unlike others. For your 1970 - 1972 Chevelle this is an accurate high quality reproduction cowl induction solenoid reproduction includes imprinted part number on case as original.